There have been many creative responses to Beowulf. To read more about J.R.R. Tolkien, start at this page on this site. To read about John Gardner, turn to this page. 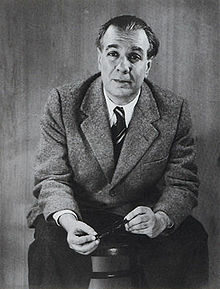 Jorge Luis Borges, the brilliant Argentinian writer, has likewise been fundamentally influenced by Old English culture, as well as Nordic myth. Yet another author inspired by the Middle Ages is Poul Anderson, who came up with scientific words dealing with atomic theory without use of Latin or Greek to show how such words would look like with only a Germanic base. It has been suggested by Donald Hofstadter that we should call this “Ander-Saxon” (for Anderson-Saxon, a parody of Anglo-Saxon). The work Anderson wrote is called Uncleftish Beholding. You can read about it here and read the actual work Uncleftish Beholding here. It appeared in Analog Science Fiction/Science Fact, volume 109, no. 13, pages 132–135, mid-December 1989. 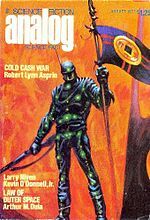 Here is a cover from the 1970s. Anderson’s story appeared about 12 years after this cover.